It is so very easy to become discouraged as we walk through life. One of the easiest ways to do this is when we are doing nothing. When we have no real goals in life we lack direction and this is when we get lost and do not know our purpose in life. 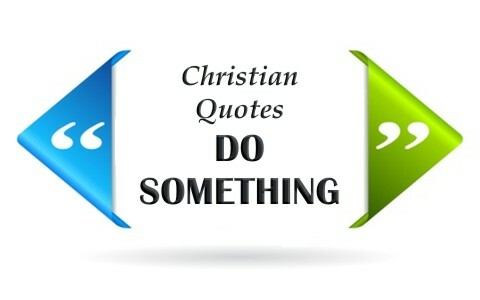 Here are some Christian quotes that I pray encourage you to do something. “If you can’t fly, then run, If you can’t run, then walk, If you can’t walk, then crawl, but whatever you do, you have to keep moving forward.” ~ Dr. Martin Luther King, Jr. Doing something, especially something for someone else, keeps our thoughts and minds on esteeming others better than ourselves (Philippians 2:3). It is quite difficult to become discouraged when we are thinking on others. Previous post: Was The Mosaic Law Copied From The Code Of Hammurabi? Next post: What’s The Difference Between Godly And Worldly Sorrow?